Like many of you, Thanksgiving was a bittersweet mixture of moments and emotions this year. Although I love the holiday season, this year is tough due to the recent deaths of my brother and a dear friend. The “firsts” following the death of a loved one are typically rough for those of us left behind. Anticipating a rather rocky Thanksgiving, I shared the day with dear friends—many of whom are grieving recent losses as well. Arm in arm, we literally and figuratively supported each other every step of the way. Yes, the absence of our loved ones was obvious. The day was painfully different from past holidays. However, despite our lingering sorrow, I was thankful for the moment. I am usually a stickler for holiday traditions. Routines. Recipes. Menus. Music. Family. Friends. Decorations. Our family traditions resonate in my bones—triggering memories, stories, and emotions. Lovely rituals indeed. However, this year I needed and wanted something different. I needed to create a buffer against my grief by doing things differently. So, I met friends for a morning coffee and chat. Then, we went for a long hike in the foothills of Denver. It was a brisk, breezing, brilliant blue sky Colorado day. We laughed. We remembered. We cried. We prayed. We wondered. We wandered. And we were thankful for the moment. Hiking in the hills fueled my desire for food. I returned home to create an eclectic Thanksgiving meal with my housemate. Our menu certainly reflected the theme of the day—different! We made a big pot of Thai Curry Chicken Soup (YUM!). Since we are both from the south, we made a batch of delicious cornbread to dip into the soup. In honor of my mom, I made her famous cranberry relish—a “must have” on Thanksgiving and Christmas. When dinner was served, I had to laugh. Not your typical Norman Rockwell kind of Thanksgiving! But ya know what? We were thankful for the moment and the delicious food. As I reflect on Thanksgiving this year, I have to admit it is one of the most memorable holidays I have experienced over the past 59 years. It is memorable not only for who was missing but more importantly for an enhanced appreciation of life—a magnified sense of gratitude and thankfulness for my countless blessings. From one of the highest points on our hike, we looked out on the Front Range—a spectacular view indeed. As the wind whipped around us, I heard a message that grabbed my heart and filled my soul—WAKE UP! PAY ATTENTION! I felt more alive and more aware than ever before. I was intentionally attentive to each moment. I looked to see. I listened to hear. I touched to feel. I spoke to connect. I loved to care. And I was thankful for the moment and the message. My experience this Thanksgiving was the balm my grieving spirit needed to continue to heal. Furthermore, my windy wake-up call serves to inform and to enlighten my journey from this day forward. I realized once again that I have a responsibility to respond to life. Furthermore, I have the freedom to choose whether to merely endure life or to enthusiastically embrace life. Consequently, Thanksgiving Day 2016, I vowed to squeeze the LIFE out of every moment. 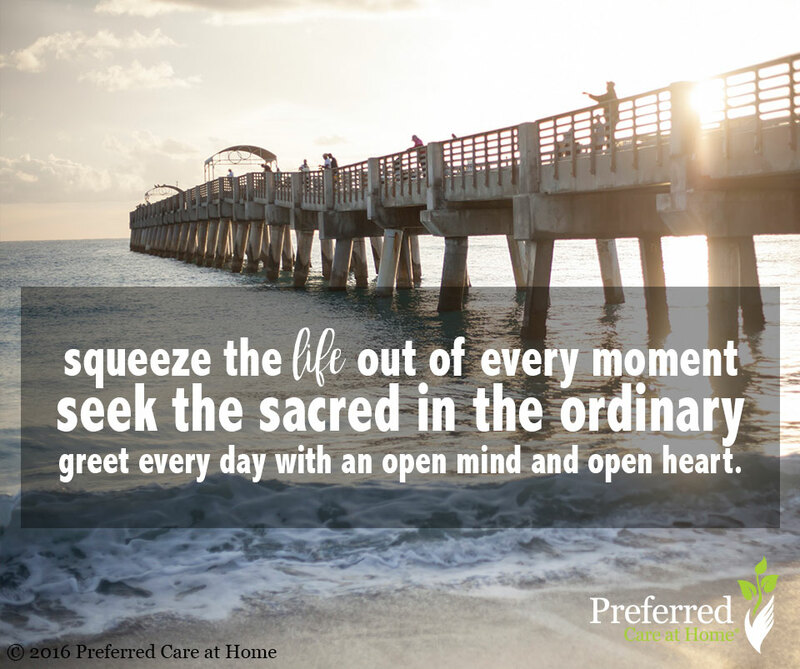 To seek the sacred in the ordinary. To greet every day with an open mind and open heart. To invest myself in people I love, critters I adore, and work I cherish. I choose to be thankful for THIS moment and to use it for the betterment of myself and others. I can think of no better way to honor my brother and my dear friend.